Soften onion in olive oil; add garlic, cumin & chillis and sautee until fragrant. Add 1 TBS paprika picante and 2 tsp chestnut honey, caramelise then add a tin of chopped tomatoes, an inch of cinnamon stick and 1 TBS PX sherry vinegar. Season lightly; simmer to thicken slightly then cover and pop in a low oven. Lightly brown a pack of M&S lamb meatballs then place these in the sauce to cook through gently over about an hour: they will be beautifully tender & moist and the sauce subtly savoury and sweet, with less a hint of Morocco than Andalucia. Serve with rice or bread. I won’t bore you with the details but something set me barking up the tree of making Bloody Marys with an Italian twist, my dilemma being how to add that sospetto d’Italiano without spending yet more money. Unlikely inspiration strikes in the form of a Martini Rosso bottle, bought for a bout of Americano/Negroni mixing but left to languish on the shelf for many a month. I mean, what do you really need Martini Rosso for, once you’re past legal drinking age? 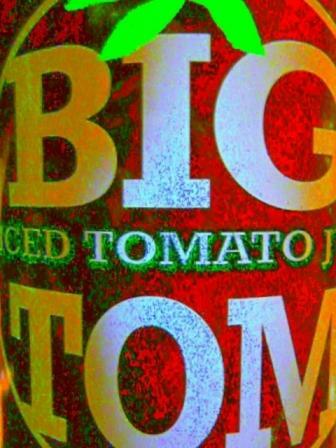 I gave its neck a doubtful sniff while holding the taste of tomato in my mind and whaddyouknow – the herbal aromas which give vermouth its character conjured a pretty appetising spectre. I’m not about to replace the vodka entirely mind – there’s a fine line between innovation and absurdity – but a dash or two of red vermouth could stand in quite nicely for the oft-suggested dose of dry sherry, surely? You betcha it can. It tastes so good that’s how I’ll be blending together this blessed brunch-time bevvy from now on … until the bottle’s finished that is: waste not want not! Combine vodka, tomato juice, Martini Rosso, Tabasco and Worcestershire sauces and horseradish in a glass pitcher and stir (preferably with a glass swizzle stick) to mix. Frost highball glasses using lime juice and celery salt and tumble a couple of cubes or so of ice in each, then top up with the vodka mixture. Garnish with a leafy celery stick snapped from the inner heart. Imbibe gently, not forgetting plenty of tasty brunch food to soak it up. I love a mix of tradition and innovation at Christmas; mingling fresh with familiar keeps things comfortably interesting (and interestingly comfortable if we’re lucky). I apply this rule of thumb as strictly to victuals as visitors – and generally have as good a day as Nigella might shake her spatula at, even when suffering from the dreaded URTI currently doing the rounds. A Christmas morning cocktail is one essential tradition but presents the challenge of tiptoeing that tricky tightrope of merriment over mayhem, and as I didn’t want this year’s first-ever goose to be cooked before getting stuffed, so to speak, I needed a milder-mannered solution than usual. It’s a cinch: take your champagne glasses, pour an inch of Campari in the bottom, fill halfway to brim with clementine juice then top up with Champagne: cin cin! – cin!!! I’ve hardly re-invented the wheel but no matter; this fluteful of festivity is deliciously more-ish yet allowed me to stay roughly vertical all day. It’s a seasonal triumvurate of Christmassy C’s; Campari, Champagne and clementine juice. Don’t be churlish about the Campari, it couldn’t be a cheerier colour and it needed using up besides. Champagne speaks for itself but Cava could slip in without disturbing the alliteration. When we ran out of Campari it turned into a CinCin – at least at my house, from which that vulgar term Buck’s Fizz is forever banned while its alternative Americanism, the Mimosa, is far too fey for us febrile few. The Cincincin on the other hand, looks festive, sounds festive and tastes festive. Hardly surprisingly, it makes you feel pretty festive too. I wouldn’t turn one down on New Year’s Day either, but in keeping with Plod tradition I daresay I’ll be mixing Bloody Marys again…watch this space. Oh bum – it’s just been pointed out to me that Sam and Eddie Hart of Quo Vadis, Barrafina et al make something very similar with their not-quite-so-catchily-called Campari and Cava cocktail. Do go ahead and follow their recipe if you like a complicated life…but if you just want a great Yuletide drinkypoo, stick with mine. Mmmm, yummy yum yum. A brand new juicy cookbook from a great galumphing goofy guy with big heart, bold -not bolshy- bearing and a neat turn of phrase. I shot to the online reservation page of my local library’s website and lo and behold picked up Valentine Warner’s hefty tome a mere two days later. The writing is delightful, most recipes have an entertaining vignette to accompany and there are plenty of tasty morsels for tryouts. As for this one, as there’s not much wild boar to be had (legally at least) on the Kent & Sussex border, pork had to be substitute in his deliciously different recipe. A fine dish for a dim and damp winter night: the following is my adaptation and scaled-down version-for-two-with-leftovers-for-lunch of Valentine’s Tuscan original, which actually serves 6-8. Heat a couple of TBS olive oil with the rosemary sprig in a heavy, preferably cast-iron pot. When fairly warm add the garlic cloves and anchovies, stirring about so their flesh melts to a sludge. Add the onion and fennel and cook covered for 10-15 minutes until seriously cooked through, only adding the juice from the lemon if it looks like drying out – which it probably won’t. Throw in the pork (no need to brown it first!) and stir, then add the wine, cinnamon stick and tomato purée; stir again then tip the lot into a small slow cooker set to auto. Cover and leave to bubble away for several hours (I’d give it a minimum of four) then toss in the olives, stir about and leave for another hour or two. Serve over polenta with a scattering of gremolata if you’re not meeting clients the next day, just parsley if you are… and steamed spinach on the side. Incidentally, this Tuscan method and flavour combination appears frequently now I come to think of it. I have cooked lamb in just the same way, but never before with anchovies and now I wonder why not: they give such a wonderful rich, toothsome savour when melted down into the background, the very essence of umami. Lemon peel and rosemary contribute their own pungent perfumes to an outstanding sauce, thickened only by softened onion and fennel, which now occurs to me is reminiscent of osso bucco – see? nothing new under the sun, yet new delights to discover every day. It’s the miracle of cooking. 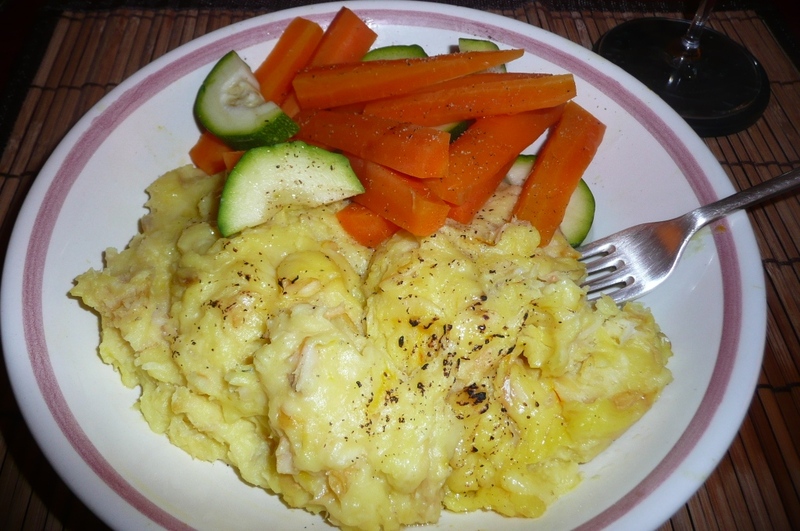 One of my all-time favourite dishes is brandade de morue – salt cod whipped up with olive oil and mashed potato plus a wee hint or more of garlic and a scatter of parsley. Much as I adore the taste, though, I’m not about to pack in my suitcase a whiffy hunk of dried North Atlantic cod just so I can then rehydrate it under a running cold tap for a couple of days before cooking. 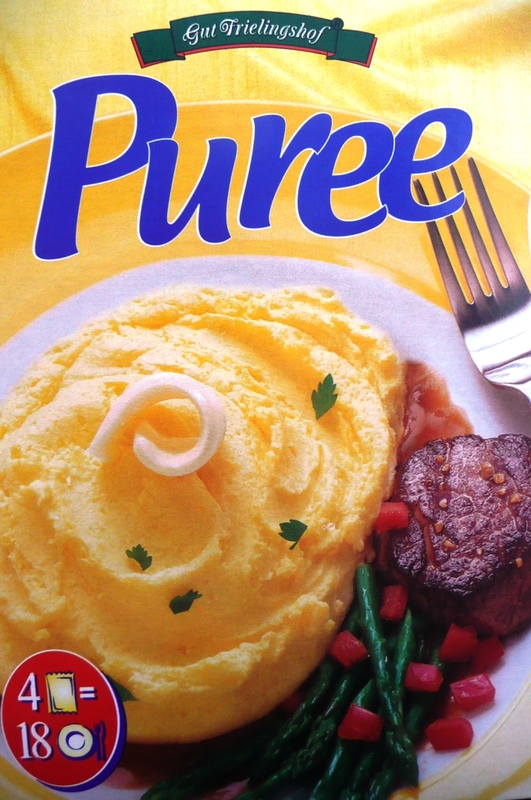 Authenticity be damned in this instance and come to think of it, I don’t remember when I last peeled a potato to make mash – certainly not since discovering this wonder-product from Lidl: 99p for a four-pouch box. If you’ve ever read the ingredients list on a packet of Smash and its ilk, the relative purity of this product will come as some surprise, for it reads thus: Dehydrated potatoes (97%), salt, emulsifier (E471), nutmeg, spices, stabiliser (E450i), preservative: sodium metabisuphite (E223), antioxidant (E304), Acid (E330). May contain traces of milk: that’s it. E471 = mono and diglycerides of fatty acids; could be animal in origin or from genetically modified soya. I can live with that, especially when pretty much all you have to do is scald 250ml milk with 500ml water and sprinkle one sachet over the top for some pretty good pommes purées. It’s definitely French-style though so don’t even think of using this stuff for fishcakes – for that you need the real McCoy! The consistency is purrrfect however, for a creamy brandade. 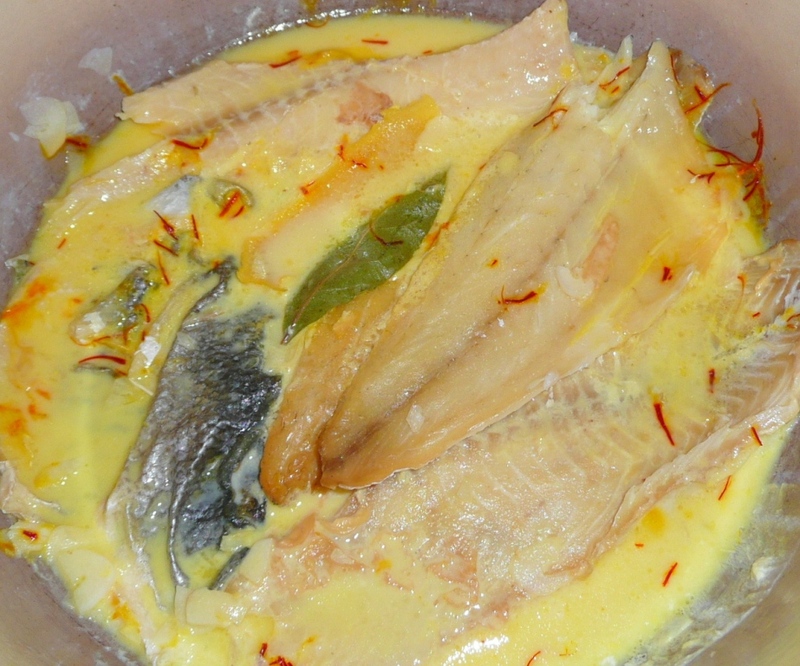 I take a few fillets of smoked fish – here I was fortunate enough to have hot-smoked sea bass and cold-smoked haddock cruising around the freezer – and poach them in the milk & water with finely sliced garlic, a strip of lemon peel, bay leaf and a pinch of saffron. I then remove the fillets, skin and flake them hot in the few minutes while the potato flakes do their magic in the hot liquid, then stir the fish back in with a fork to blend. Sometimes I shred them finely and actually whisk the mix to more closely approximate brandade but it’s not strictly necessary by any means. Well hey, I’m not going to pay a visit to our place in Nice and swan about its perfect little kitchen, brave the snooty sales ladies at Alziari for a tin of their unctuous olive oil, fossick about the farmers’ stalls for vegetables and forage for fresh herbs on the Cours Saleya and NOT idle away an idyllic afternoon preparing the greatest Niçoise cliché of all, which also just happens to be one of my favourite vegetable dishes ever, now am I? Its fall from fashion since its 80s heyday probably had much to do with the ghastly glutinous supermarket tinned travesties I remember not enjoying at all – and I only resurrected this recipe having enjoyed the real McCoy so much Chez Palmyre I had to recreate it myself at home. 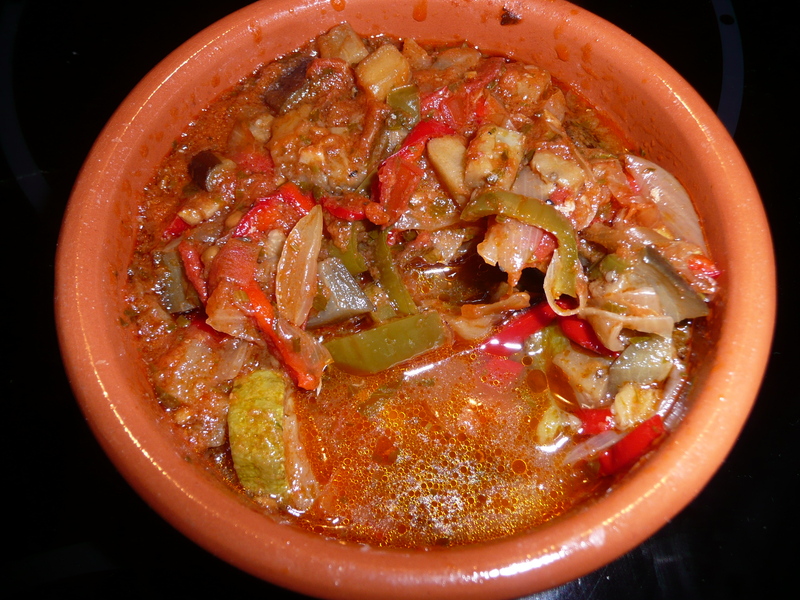 So delicious it could turn you vegetarian, ladies and gentlemen: I give you ratatouïlle. 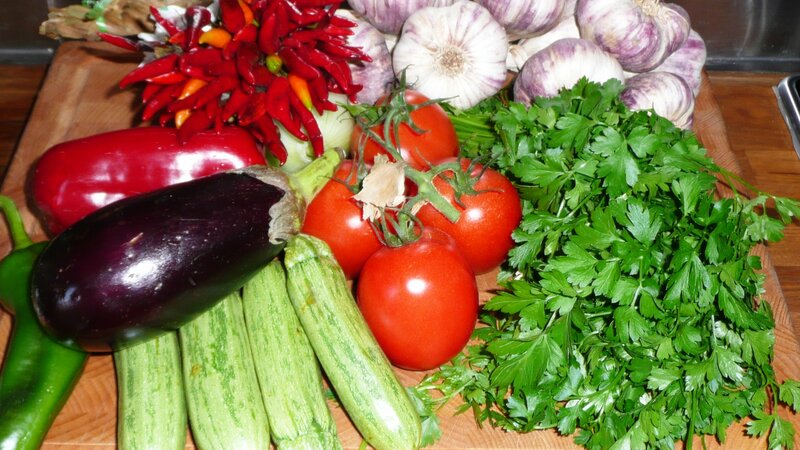 Follow the correct principles using decent ingredients and you simply cannot go wrong. I’ve never made the same one twice – vegetables vary in ripeness, juiciness, depth of flavour and the way they’re sliced or chopped makes a great deal of difference – but I’ve never made a bad one either. Folk can get so precious about this sort of classic recipe but the fact is there is no one classic recipe. In its home town nobody makes it the same as their neighbour, so why should you? Just don’t undercook the vegetables nor stew them together without giving each its initial independent sauté – far less hassle than one might suppose. Oh – and don’t overdo the tomato. Preferably in a cocotte, but if not at least in a high sided saucepan, gently fry the sliced onion in a couple of tablespoons olive oil until softening, then slip in the garlic and sizzle briefly before adding the tomatoes. Stir to mix, drop in the thyme (and orange peel if using) with a pinch of salt then leave to cook down steadily on a low heat while you sauté the other vegetables. I think it a nonsense to use separate pans for each vegetable – although one must respect their individual characteristics and sauté them separately – so take a wide and heavy-based frying pan, heat a tablespoon of olive oil and toss in the peppers. Cook over a medium heat for 5-odd minutes until softened then add them to the pan of onion and tomato; stir to combine and continue cooking down gently. 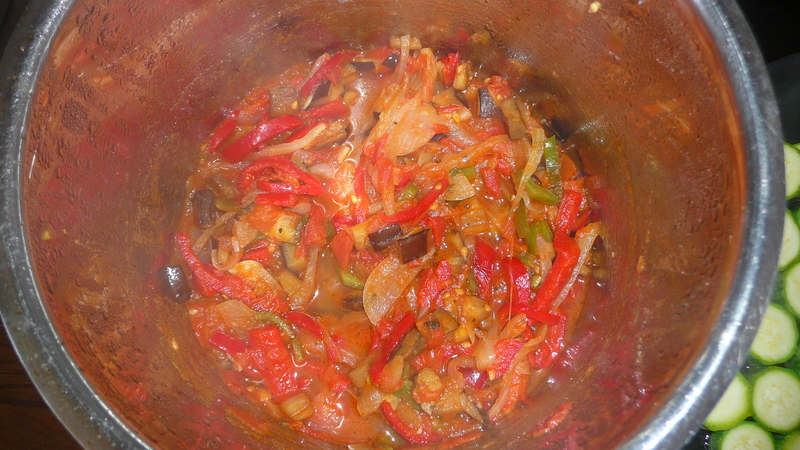 Same pan, two tablespoons of olive oil: heat and throw in the aubergines. Cook fairly briskly, tossing the dice about so they don’t stick, for between 5 and 10 minutes until they are definitely cooked, then tip into the other pan. 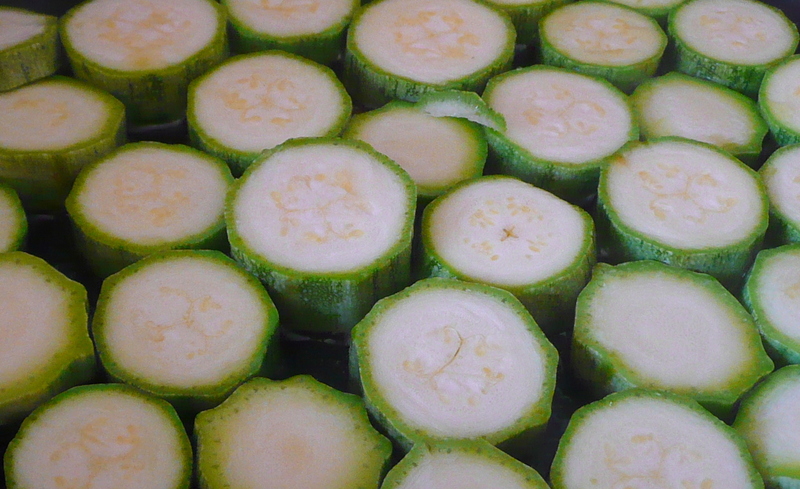 Same deal with the courgettes: perhaps a little less oil and a gentler heat needed here. 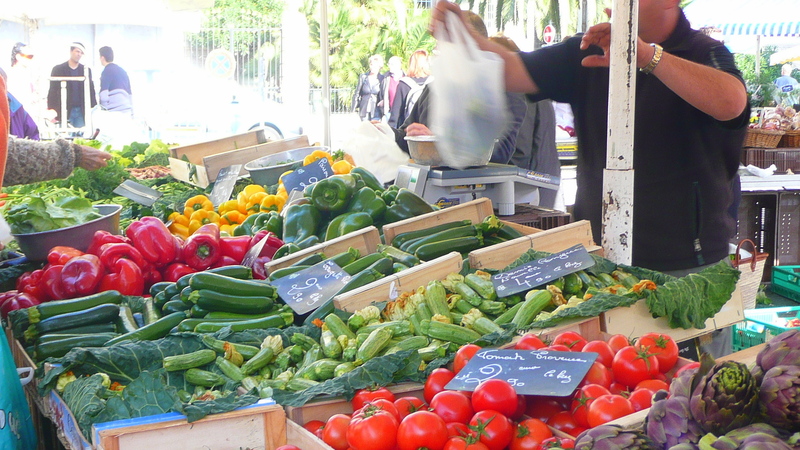 Do make sure they have really softened sufficiently before adding to the ratatouille pot as they will not cook much further and a crunchy courgette is not what is wanted. Give the master pot a good stir and allow to simmer a very few minutes. Taste, season; enjoy. Ratatouille is good eating right away and even better once the flavours have had time to settle in with each other. Hot, cold, tepid; it’s both a fine accompaniment and solitary dish: good crusty bread is its best friend, especially if your ratatouille is on the watery side (no bad thing, btw). Fab to come home to: comforting when reheated on a wintry day and refreshingly cool on a sultry evening. With hot sunny weather forecast for Saturday all other plans went on hold so we could seize the chance to soak up every available ray of sunshine on the deck of our new penthouse apartment. Thanks to the frankly not great British summer it was our first opportunity to bask under an open blue sky since moving in at the beginning of August, so in holiday mood I hauled out the deep fryer from deep storage and tossed in a shoal of whitebait for a nautical treat. Resurrecting my darling porcelain fish platter was sheer delight, and as it received the rustling cascade of tiny crisp fishes I think I may even have seen it crack a smile: or was it the combination of French rosé and UV rays going to my head? I think not. Defrost the whitebait in a bowl, with the milk poured over, overnight in the fridge. Drain well and discard the milk. Heat the oil to 190C. Mix together the flour and pimentón in a large bowl and toss in the whitebait. Shake the bowl about to coat the fish then transfer them to a colander and gently shake off excess flour. 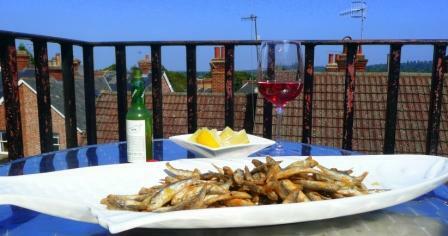 Tip the whitebait into the fryer basket, lower carefully into the oil and fry for two to three minutes. They’re done when they float so keep a close eye and don’t cook them any longer than necessary. Served with lemon quarters and green tabasco: briny heaven on a fish plate. 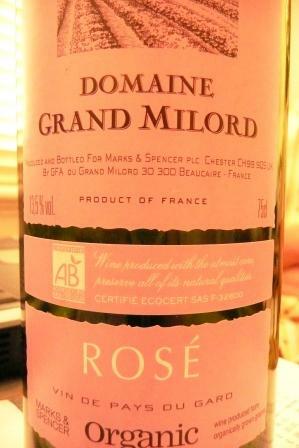 This bottle of Domaine Grand Milord organic rosé was a perfect accompaniment, made from 10% Syrah and 90% Caladoc. It’s not every day I come across a grape variety I’d never heard of: a quick google reveals that Caladoc is a disease-resistant hybrid of Grenache and Cot, both respectable southern French varieties, and being deep coloured and with ageing potential a tasty choice for making into rosé: and organic to boot: cin cin!